While many digital cameras today don't have an FV lock, virtually all have an AE and AF lock. Unfortunately, few digital camera owners know what these locks are, nor that their cameras have them. It's unfortunate because they are extremely useful camera features. AF-L or AFL — Autofocus Lock: When using auto focusing, this locks focus even when the camera is moved to recompose the photo, prior to making the photograph. AE-L or AEL — Autoexposure Lock: When using any of the automatic or semi-automatic exposure modes, this locks the exposure settings, even if the light changes or the camera is moved, prior to making the photograph. FV Lock — Flash Value Lock: When using an automatic setting for your built-in or external flash, this locks the power output level of the flash, even when camera is moved, to recompose the photo, prior to making the photograph. I use these locks often, especially the AF Lock. I consider the AF Lock as essential as the ISO, Shutter Speed, and Aperture exposure controls. Consider this scenario. You're at the historic and famous Galapagos Islands, hiking on the sometimes barren looking Española Island. You're part of a group and want to photograph the group while simultaneously showing off the island. The problem is, like many travel photographic opportunities like this, the best composed shot is one which puts the members of the group at the side of the photograph. If you compose the photograph with the group on the side, while the landscape will be in sharp focus, the people probably won't. If you focus on the people, then recompose the photo, the people still won't be in focus when you repress the shutter release. You could set your camera/lens to manually focus the scene, but after spending all that cash to have autofocus capability, that seems a waste. You need to use the AF lock. For most of today's digital cameras, the focus lock is built into the shutter release button. Press the button halfway down, autofocus is activated and once the proper focus is achieved, as long as you continue to hold the button halfway down, the focus will remain locked, even if you move the camera to recompose your shot. That's exactly what I did for the Galapagos' photograph above. I centered the camera on our group, hiking down the long path, focused on them, locked the focus, recomposed the shot, then pressed the shutter release the rest of the way down to make the photograph. The use of the AE Lock is somewhat less straight forward. More often than not, you don't want to lock your exposure settings until the last possible moment, but there are circumstances where that's not the case. One could always use manual exposure, but why underutilize the wonderful built-in meter in your camera. My typical use of the AE Lock is when I need to expose for a specific part of the scene, which has a significant difference in luminance across the image. Note the luminance in the photograph taken at the San Diego Wild Animal Park. 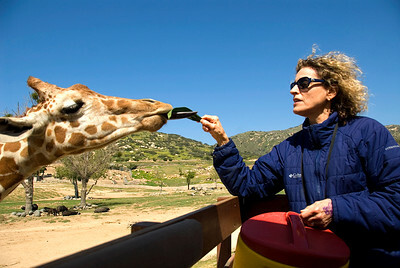 I used a the camera's meter in spot meter mode, aimed at the face of the woman in the photo feeding the giraffe. Since I had to move the camera to reframe the photo, I pressed the AE Lock button first, to prevent an exposure settings change as I reframed the photo. In this case I also focused on the woman and kept focus lock on too. Many DSLRs permit the AE lock to also act as an AF lock, and often assign the dual purpose by default. More often than not, however, photographers need to lock one or the other, not both simultaneously. The photo above is the exception. I suggest, if possible, set you camera to separate the two locks, so you can lock focus and exposure independently, or together, as needed. The FV lock is the least understood of the three locks. Today's modern electronic flash units, in concert with the camera to which they are attached, determine their light output for each photograph. While a photographer can manually set the output, allowing the flash to self-determine its output, is generally easier, and results in a highly accurate setting. Flashes today accomplish that task by sending out a preflash to determine the appropriate output level. The preflash shines on the central area where the camera is aimed, however, the subject you're trying to illuminate with the flash may not be centered in your photograph, but the flash doesn't know that. Under that circumstance, center the subject in the viewfinder, press the FV lock to have the flash send out its preflash and determine its output. Then continuing to hold down the FV lock (for most cameras), recompose and make the photo with the flash at the appropriate level for your subject, regardless of where they are located in the photo. I hope this helps you understand the use of these locks and you'll now be able to use them to improve your photographs. Wow Ned, I had no idea my camera had a focus lock. I've been using manual focus a lot and it's been a pain in the neck. I looked it up and sure enough my camera has an autofocus lock. Ned, I have my D7000 set for 3D tracing focus. Once I focus on a subject, I can move my camera around but the focus point stays locked on my subject. Would I be right in saying that this works as well as focus lock, or is another form of focus lock? Mike, it's not a real focus lock, as it's possible to fool the camera and lose focus using this method, but there's actually a major reason not to use this method for locking in your focus for stationary objects. The way 3D tracking works, when the shutter-release button is pressed halfway, the colors in the area surrounding the focus point are stored in the camera. Therefore 3D-tracking may not produce the desired results with subjects that are the same color as the background or that occupy a very small area of the frame. In fact, I've seen the effect, and it wasn't pretty. This AF focus mode is to be used to quickly compose pictures with subjects that are moving erratically from side to side (e.g., tennis, football, hockey, other sports). I wouldn't use it for stationary subjects or anything else, generally. For stationary subjects I suggest single point AF on the D7000, and for predictable or somewhat unpredicable movement, use 39-point dynamic-area AF. Only when the movement is truely erractic would I use 3D tracking on your D7000.